← Stay Happy & Healthy This Winter! Exciting news! Many of our Valentine’s Day merchants are offering increased rewards percentage right up through February 14th! Both The Popcorn Factory and Cheryl’s are increasing their rewards from 6% to 8% SchoolBucks for K12Rewards members. So when you purchase your Valentine’s Day gifts through K12Rewards, you’ll not only get a great gift for your loved one, but you’ll earn even more rewards for yourself and your family! Have a popcorn lover in your life? The Popcorn Factory offers a delectable assortment of sweet and salty varieties of this classic treat, all in festive, colorful tin cans. You can choose from chocolate caramel dipped popcorn hearts, a Valentine’s Day monkey love tote bag of goodies, or even a popcorn heart decorating kit. For those of us with insatiable sweet tooths, Cheryl’s has the perfect mix of cookies, brownies, and chocolate-covered pretzels, such as this classic cookie and brownie gift box, or this adorable “bee mine” cookie flower pot—guaranteed to bring a smile to anyone’s face. So, whether your loved one prefers salty or sweet, be sure to shop at our merchants this Valentine’s Day to find the perfect gift AND get an increased rewards percentage! 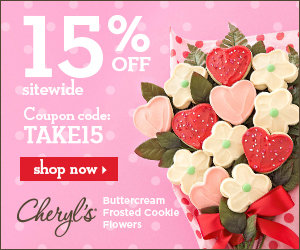 Stay tuned for more awesome deals with Valentine’s Day merchants!